The importance of getting away from it cannot be over stressed. No matter what ‘it’ is, there is some argument for getting away from ‘it’ for a short period of time. This week’s ‘it’ was civilization. Or more accurately, city living. The perfect location for this is central France which boasts less towns per square kilometre than most other places in Europe. And at the tail-end of the summer still has pleasant weather, unlike the Netherlands which barely had pleasant weather in the height of summer. In the middle of the ‘Nowhere’ region of France my parents are (in short bursts) transforming a disused farm into something very habitable. They’ve come a long way in the years they’ve had it, but still there is much to do. Rome wasn’t built in a day, and, as they say, renovation takes twice as long as novation. The house at least is mostly habitable and one day the associated barns may also be. But for now they range from intact to tumbledown. One other set of farm houses are visible from the house, but apart from that, and two others not too far away, the place is isolated as far as us city dwellers are concerned. If you feed in the local airports into the Air France site, it comes back trying to sell you train tickets. Approaching by the air is possible, but not easy, unless you are coming from England, in which case you can fly into some of these smaller airports. This is because the people in that area with any money are not French, they are English. In fact it was interesting to see how the area has changed in the last few years since I was there. The Charente is getting more like the Dordogne, where, if you meet someone who isn’t English, it is because the are German or Dutch. Okay, this is a slight exaggeration. But when you go into a small town and you hear more people speaking English than in Amsterdam, something is up. The fact is of my parent’s three neighbours, one of them is an English family. In the end we flew to Paris and took the train down. French trains are fast and comfortable where English trains are... delayed, so the journey was very pleasant. And the flight was just about up in the air long enough (45 minutes) for the stewardesses to throw sandwiches and coffee at you. We were met at the train station by my parents. My parents have three modes of transport currently in this country. A jeep, that doesn’t start, a campervan that is plugged in to the electricity and a large, noisy, white van. It is the latter they used to collect us. The seats in the back being especially re-added after much time spent carting building supplies. In recent years, my parents have had some company when they are there. 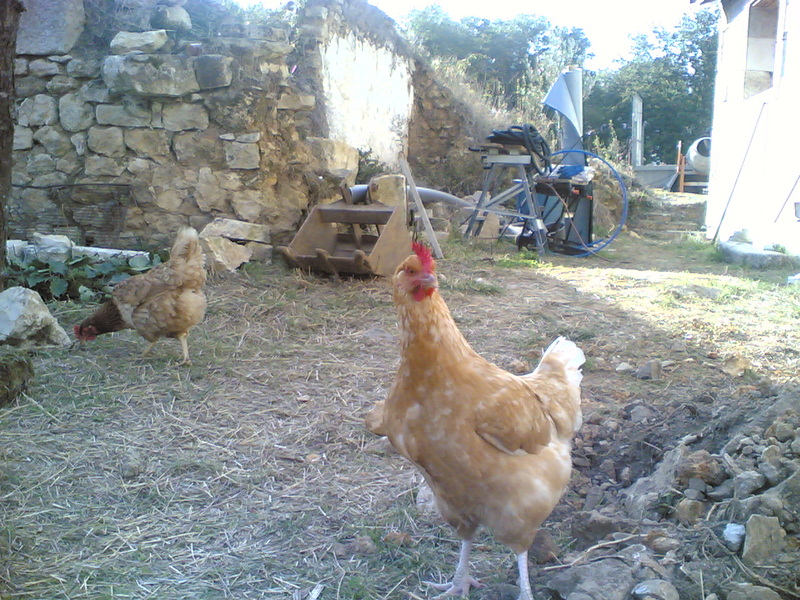 Not only the dog, suitably chipped for easy movement around Europe, but also two chickens. The chickens spend their day nervously clucking around the grounds pecking at the ground and their evenings bathing in the dirt. They eat well. As well as things they find themselves, such as worms, snails, and even frogs, they have a meal specially cooked for them (I kid you not). In return they lay (usually) one egg each per day. 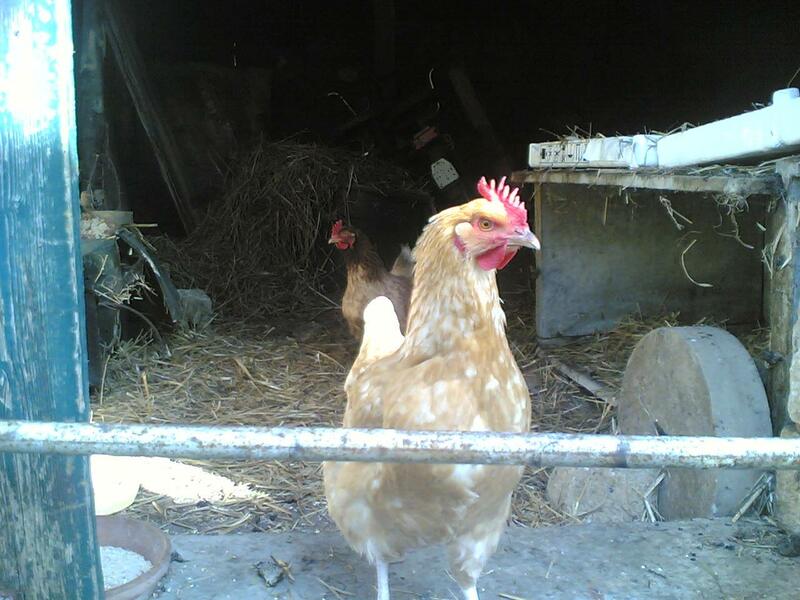 The chickens are definitely free-range – but rarely wander too far away from their barn, even wandering back there at night fall and waiting for it to be shut up. Chickens have the same walking motion of pigeons and certain other birds, whereby their leg muscles are connected to their neck muscles so that their heads move back and forth as they walk in a ridiculous and not un-John Cleesiastical way. They are endearing and stupid creatures, fussing around like old ladies and eyeing humans with the highest of suspicion.